This is the best chicken meal prep recipe because it's easy to make and has so much flavor. 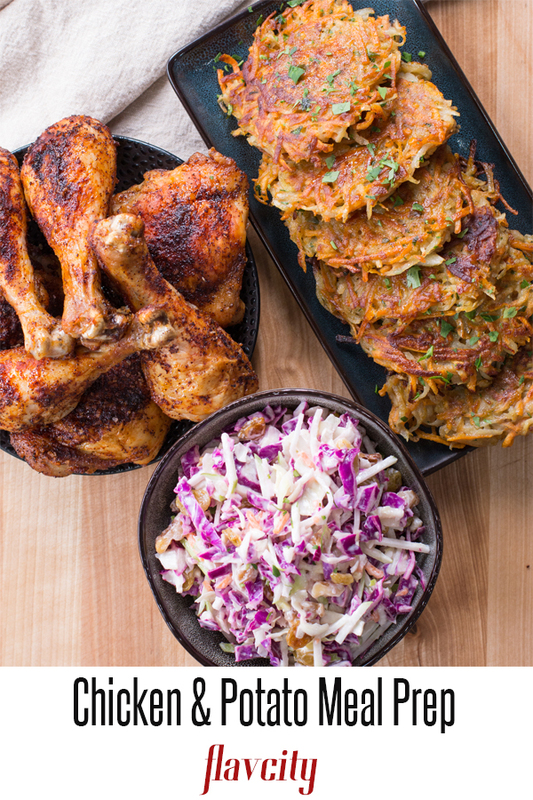 Oven roasted chicken meal prep with crispy potato pancakes and slaw. 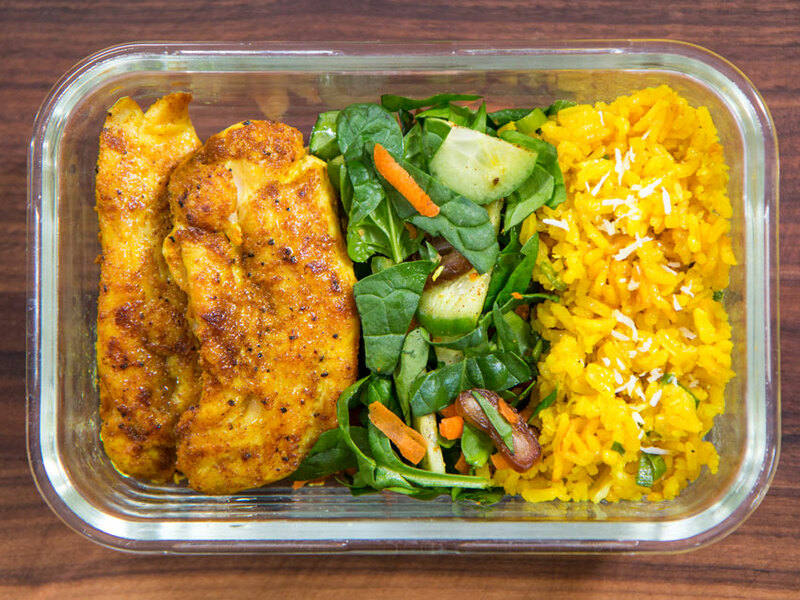 This easy chicken meal prep recipe is full of flavor and so satisfying. The chicken is spice crusted and oven roasted, the best way to make bone-on chicken for meal prep. The potato pancakes are a mix of sweet potatoes and starchy potatoes, and cooked until golden and crispy. 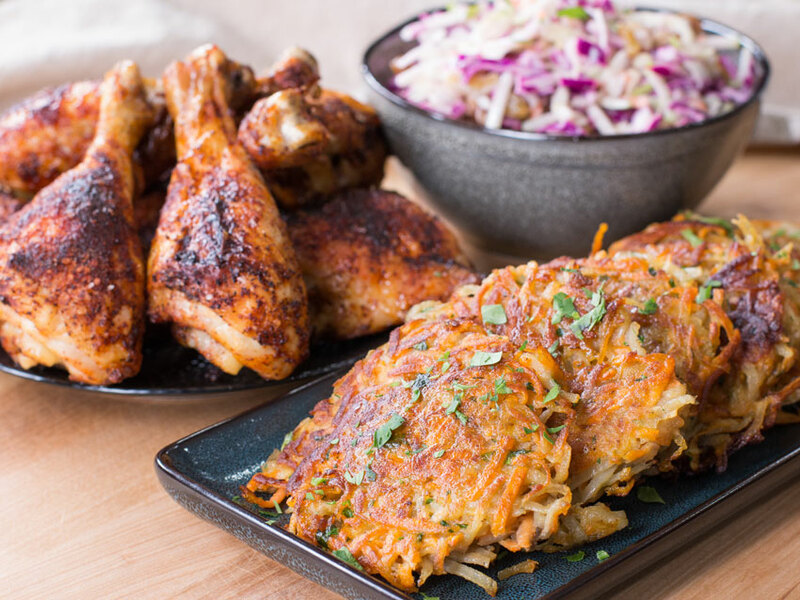 The red cabbage crunch slaw is fresh and tangy, it pairs perfectly with the chicken and potato pancakes. Pre-heat oven to 400 F. Make the spice rub for the chicken by combining the onion, garlic, ancho chile, and smoked paprika powders in a small bowl, mix well. Place the chicken on a sheet tray and season all over with a generous pinch of salt and enough spice rub to coat, saving any leftover rub for next time. Drizzle a shot of oil over the chicken and rub the seasonings all around. 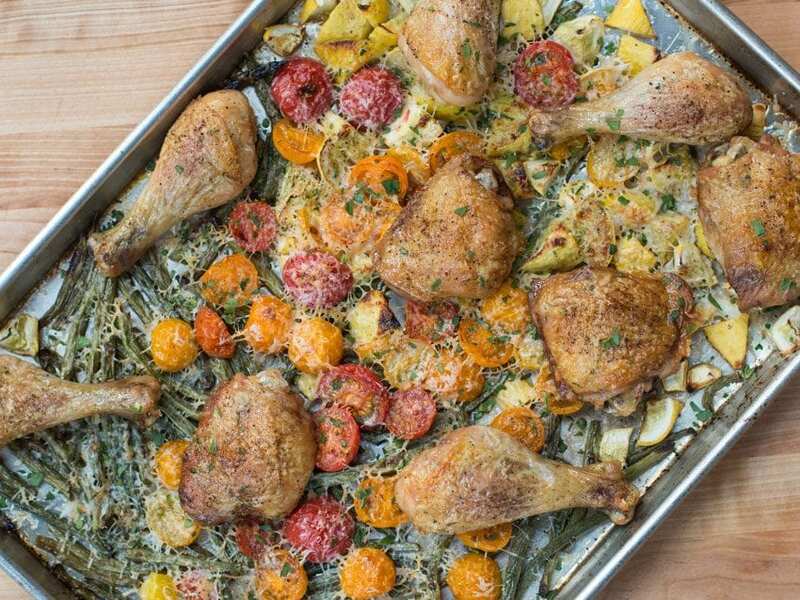 Place the chicken skin side up and cook in the oven for 55-60 minutes. Meanwhile, peel the potatoes and drop them in a bowl of cold water to prevent them from browning. Use a box grater set on the largest setting to grate all the potatoes and then peel and grate the onion. The next step is very important, place some of the mixture in a kitchen towel and squeeze as much liquid out as you can. Place the dry mixture in a large bowl and repeat with remaining mixture. Add the eggs, corn starch, baking soda, parsley, ½ teaspoon salt, a few cracks of pepper and mix very well with your hands. To make the process go quicker, pre-heat two pans(non-stick or cast iron) over medium heat with enough oil to just cover the bottom of the pan. The oil is hot enough when a little piece of potato sizzles. Form 3 inch wide cakes and place them in the pan, making sure they are not too thick or they won’t cook through. Cook for 5-7 minutes, or until golden. Flip and repeat. Cook remaining batches and if desired, keep pancakes on a sheet tray in a 300 F oven to keep them warm and crispy. This is also the best way to reheat them. For the slaw, combine the slaw mix, walnuts, and raisins in a large bowl. Use a mandolin or knife to cut the apple into matchstick size and the squeeze enough lemon juice over to coat, mix well. Add the apples to the slaw and mix well. Make the dressing by combining the mayo, juice of half a lemon, 1/8 teaspoon salt, and a couple cracks of pepper in a bowl, mix well and check for seasoning. You may need more lemon juice as you want the flavor to be on the acidic side. Keep the salad and dressing separate in the fridge and dress right before eating. 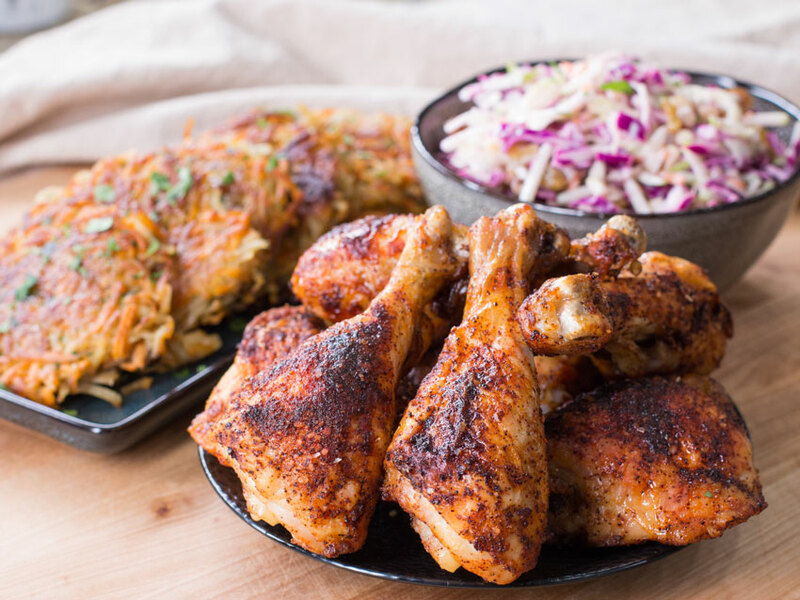 Plate the chicken with a few potato pancakes and some dressed slaw, enjoy! Everything will keep in the fridge for 5 days, you can freeze the potato pancakes and chicken for 2-3 months, but not the slaw. The best way to reheat the potato pancakes is how I mentioned above in the oven, you can do the same for the chicken for about 15 minutes. If using the microwave make sure to cover container with a wet paper towel and don’t overheat the food, it will get dry. I love you so much, Bobby. Thanks for being such a great cook with some amaze-balls ideas. Loving your personality, knowledge and Flav! Fun to watch with great ideas for healthy eating. What could be better? oh wow..i am lovig you Anne..thanks so much for the kind words!